Although I have a slight fear of heights sometimes (like on top of an elephant or while jumping from a boat - what is wrong with me?! ), I always look out for a high point in a new city to experience it from above - to identify what I've already been to and where I still need to go, to compare it to the map I've been studying, to have my breath taken away by the views (and in some cases, by the climb up to the views). I've of course ridden up the elevator to the observation decks at the Empire State Building but that required very little on my part. In terms of adventures that actually took effort, I've climbed up numerous towers in castles in Ireland, climbed 259 steps of St. Paul's Cathedral dome in London, and trekked up 366 steps of the bell tower in Bruges. If you're planning on seeing Florence from above, you have a couple options right in the middle of the city. 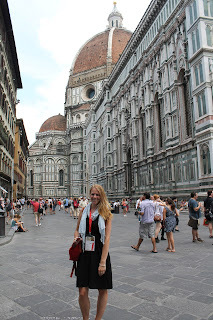 Florence's skyline is defined by Brunelleschi's famous Duomo of the Basilica di Santa Maria del Fiore. My dad has read and reread a book about this dome and therefore our trip to Florence was widely defined by the Duomo as well. 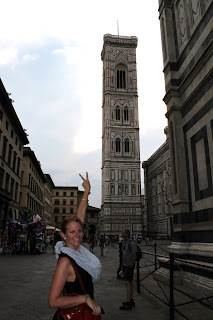 He would express while choosing walking paths, "But if we go this way, we will miss the Duomo!" even though we'd already seen it twice that day. At first glance on our first day, the Duomo, the church, and the bell tower appeared fake to me, as if we were in Epcot and these buildings were all just huge flat facades, I felt like they didn't fit in right there. Maybe this thought came to me because I had been smacked hard in the head with construction materials when entering the train station in Rome earlier that morning, but that's a story for another time. My dad, sister, and I had of course planned to climb to the top of the dome - to see the city from above and to fuel my dad's obsession. My mom decided she would sit out of this adventure. But the first day in Florence, the line for the dome was winding and we realized we could wait in a much shorter line to climb Giotto's Bell Tower and could come back another time for the dome. The dome opens at 8:30 each day so we went back on our last (foggy) morning and only had a few people in front of us. But which one should you climb if you don't have the time or energy to do both? Here are a few details to help you in the event you have to choose. Difficulty: The Bell Tower has fewer steps (414) than the Duomo (463), but overall it is the harder climb, or at least the harder descent. The Bell Tower has more levels at which you can stop and rest, but in certain spots, the path is way more winding than the Duomo. 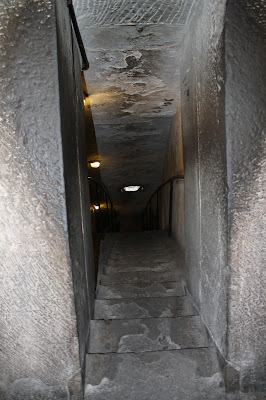 The Duomo also has only a few stretches where people are going up and down on the same staircase. The Bell Tower is two-way the entire trek up and it can be a little more claustrophobic when your body is as flat against the wall as possible and you are sucking in your gut to the best of your ability and trying to avoid being smacked in the face by people's backpacks at the same time. View: As mentioned, the defining aspect of Florence's landscape is the Duomo, so from the Bell Tower, you get an extraordinary and postcard-perfect view of Florence proper. 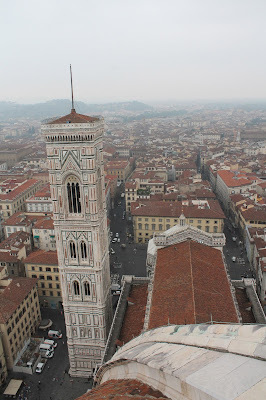 But the Bell Tower, as seen from the Duomo is nothing to sneeze at either. 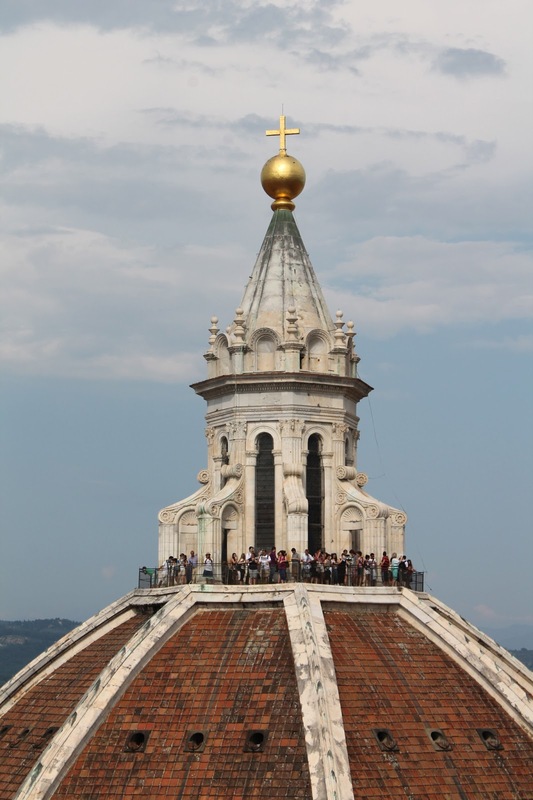 The Bell Tower has a cage on top so the Duomo is the less obstructed view and may be a better backdrop for scenic photos. On the other hand, at the Bell Tower, you may feel safer in a more enclosed area, knowing that you aren't going to fall. Extras: When climbing the Duomo, you are on top of the church Basilica di Santa Maria del Fiore and can get out of the stone staircases for a little bit to walk around the top of the dome while inside. Painted inside the dome is a stunning Last Judgment fresco. To see the painting from the floor of the church a few days prior and then to see it from right up against it was quite interesting. The paintings as viewed from the dome are so large and in some cases, a little stretched out, but from below, they look as they should. It really makes you wonder how the artists planned it and how many times a day they had to travel up and down to make sure they were doing something that looked good from the floor. It's up to you to decide. Whatever you choose, remember Miley's wise words..."Ain't about how fast (you) get there. Ain't about what's waiting on the other side. It's all about the climb." And hold on to the walls as you make that climb.